OVER 100 TASTES SERVED BY MORE THAN 30 LOCAL CHEFS, BREWERS, DISTILLERS AND MORE! FOR THE LOVE OF LOCAL FOOD & DRINK. The Taste is a must attend annual event for anyone who enjoys exploring the unique flavor that our local food and drink artisans have spent years crafting. The Taste is an evening out in the unique atmosphere of an airplane hangar located at Neptune Aviation. The air will be filled with live and local music and plates will be filled with over 100 deliciously crafted food and drink tastes from nearly 40 local chefs, brewers, distillers, vintners, and other unique establishments! A silent auction and Everyone wins! raffle offers several unique hand-crafted items, vacation getaways, gift cards from local food and drink establishments, along with many other fun and exciting giveaways. General Admission entry opens at 6 pm. 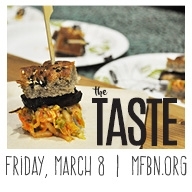 The Taste is an event to benefit the programs and mission of the Montana Food Bank Network.